Resound has updated their product line with a new range of premium plus hearing aids called the LiNX Quattro. 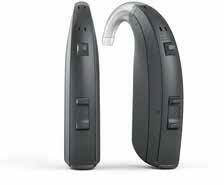 The Quattro range is made up of two Receiver In Canal hearing aid models at two levels of technology. This is a little unusual for Resound, however, these are pretty unusual hearing aids, let me explain. We have been using the LiNX Quattro since October and we are exceptionally impressed with the devices, so are our customers. 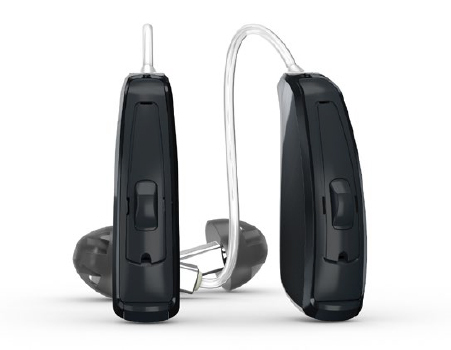 The LiNX Quattro LT-61 is a Lithium-ion rechargeable, direct connection, Bluetooth enabled or Made For iPhone hearing aid. In fact, it is an industry leading rechargeable option that offers thirty hours of use on one single charge. The case it charges in also holds three full days of extra charge, which means even if you forget your charger lead, you can still charge on the go. In fact a whole long weekend of power. Resound have redesigned the wireless radio and they say that it is more powerful than ever before. That means a very stable connection to the iPhone and hopefully Android phones when Android releases the new version. While they have used the chip upgrades to improve the power consumption, the rechargeable option allows you the comfort of never having to worry about hearing aid batteries. As we said, the battery life is also fantastic, Resound say that you will get 24 hours of life even if you are streaming for 50% of the time, that's amazing. The device shown above is the rechargeable option, but they are also offering a traditional hearing aid battery model which is based on the LT-62 using a size thirteen battery. Resound have not introduced the devices as a replacement for the LiNX 3D, rather, they have introduced them as a new premium price point above the LiNX 3D 9 and 7. As I said, they have introduced two RIC models, it will be interesting if the expand the models and the price points. We will keep you updated as to what they do next. Compatible with all Resound Wireless Accessories like the Micro Mic, Multi Mic etc. Resound have just launched their latest hearing device for people with severe to profound hearing loss. They have updated Enzo Made For iPhone (MFI) hearing aids with their new 3D platform which brings all of the benefits of that new system to this market. Those benefits include better spatial awareness and much better speech understanding in noise. 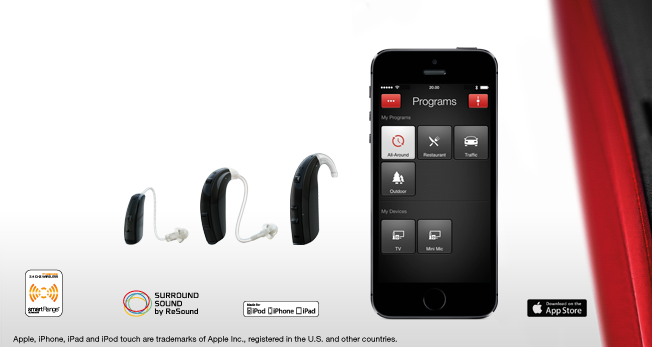 With Made for iPhone® technology, you can stream phone calls, music and more from your iPhone, iPad® or iPod touch® directly to your hearing aids. If you have an Android or any Bluetooth-enabled phone, you can still stream calls, music and more with a discreet ReSound Phone Clip+ wireless accessory. Like the LiNX 3D range from ReSound, Enzo 3D hearing aids come with the superior sound quality of Surround Sound by ReSound. They work together, continuously exchanging data about your sound environment for optimized performance. The hearing aids are available in three levels of technology, the top of the range 9, the 7 and the 5. There are two hearing aid models in the range both of which are Behind The Ear hearing aids and both of which are extremely powerful. The BTE 88 is the smaller of the two and takes a size 13 battery. The BTE 98 is larger but takes the 675 battery that many people with this hearing loss are used to. The 98 is also more powerful than the 88, although not by much. However, Resound say that the 98 will get twelve days of use on the 675 battery, that's fantastic battery life for a smart hearing aid. Resound Assist is the really big news for both Providers and Users. Resound Assist will allow your provider to adjust your hearing aids remotely. That means if you want adjustments on the go, they can be provided without you having to attend the clinic. The system is really easy to use and is quite intuitive. This might not be for everyone, but this feature will be a godsend for the people who love it. It will allow them complete freedom over their experience, over their customer experience. The accompanying app also allows you personalise your hearing experience in a deeper way. It has been re-designed to be more intuitive and easier to use and it offers real control. When more clarity is needed, patients can increase speech focus, reduce noise and even reduce wind noise. Again, this might not be for everyone, but for those who want it, it will enrich their experience. This has to be seen as an excellent thing. ReSound was founded in 1943 by Gert Rosenstand, the company the company has grown from humble beginnings into one of the five biggest hearing aid manufacturers in the world. ReSound has been known for superior sound quality and innovation for many years. More than that, they are known for design excellence and delivering meaningful solutions that help hearing impaired people rediscover sounds. ReSound has been responsible for a number of hearing industry firsts: WDRC (Wide Dynamic RangeCompression) broke new ground for sound processing and they were the first hearing aid manufacturer to deliver open fit hearing aids. They have always been a central supplier of hearing aids for us, their commitment to us and our Patients has ensured that they remain one of the hearing aid manufacturers that we offer at our Practice. ReSound is renowned for pioneering innovative solutions for both adults and children who suffer from hearing loss. Those solutions go far beyond just hearing aids and include wireless accessory systems. ReSound are viewed as one of the premium hearing aid manufacturers, delivering strong innovation and design. With their introduction of the LiNX™, the first Made For iPhone hearing aids, they truly displayed their ground breaking innovation. LiNX™ was the first of the Made For iPhone hearing aids to reach the market and it is packed with features that really use the iPhone for outstanding communication results. It will be interesting to see what path this technology takes us on. Of course they have gone one better with the introduction recently of the new LiNX2 range of hearing aids with new styles and new features. Their commitment is to create innovative hearing solutions that constantly increase user satisfaction and acceptance. Every day sounds are lost for millions of people with hearing challenges, ReSound continuously develop solutions to help people rediscover their hearing, so they can live rich, active and fulfilling lives. They are committed to doing this through ongoing research and the constant introduction of innovative solutions. The ReSound LiNX 3D includes GN Hearing's 5th generation 2.4 GHz wireless technology and 3rd generation binaural directionality. They say it will provide users with "clear, natural sound, exceptional speech understanding and the best sense of where sounds are coming from." There are eleven different hearing aid models in three levels of technology. 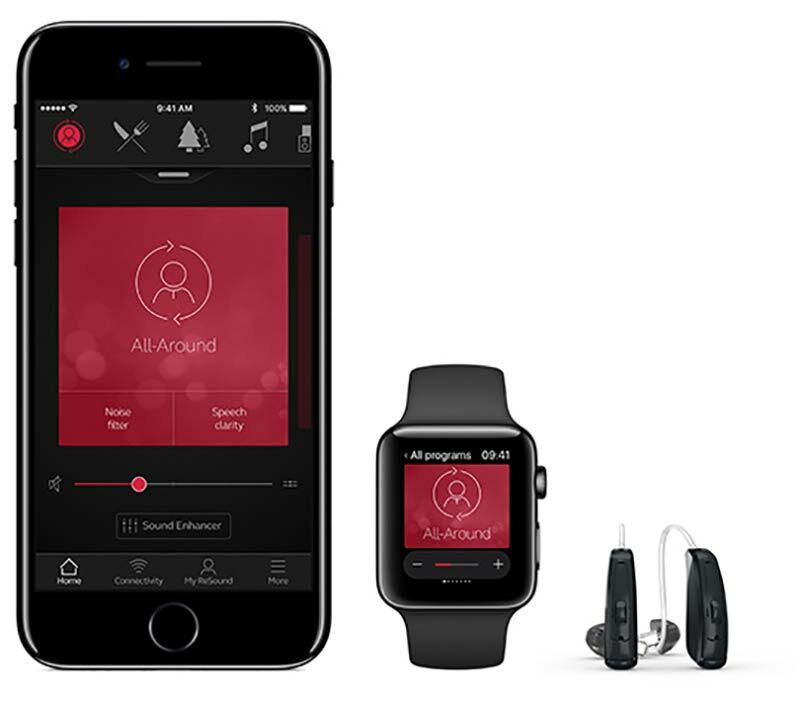 When connected to the brand new apps that have been designed for iPhone and Apple Watch, users will be able to access custom control features for the hearing aid. There is also built-in guidance steps to understand both the hearing aids and the software, there is also coaching assistance to get the most out of the hearing aids. When compared to competitors, the company said that the ReSound LiNX 3D and companion app are up to 50 percent better at identifying speech across various environments, enable users to hear up to 80 percent more of the sounds around them, and enable users to understand up to 40 percent more speech in noise. The ReSound LiNX 3D includes GN Hearing's 5th generation 2.4 GHz wireless technology and 3rd generation binaural directionality. They say it will provide users with "clear, natural sound, exceptional speech understanding and the best sense of where sounds are coming from." 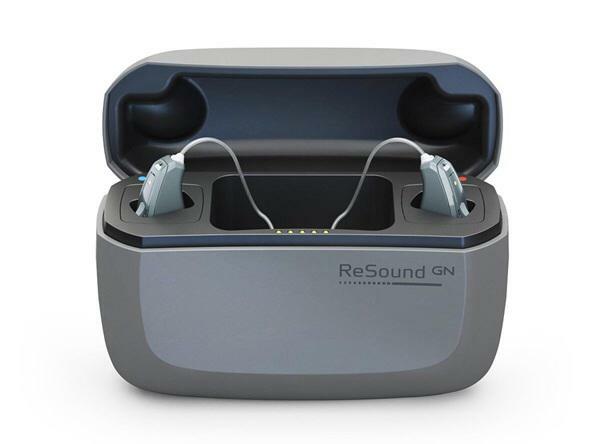 The Resound LiNX 3D 7 hearing aids are the latest mid-range, Made For iPhone hearing aid technology from GN Resound. While they are a mid-range device, Resound has packed them with excellent features designed to give you the best experience. They should still deliver fantastic results even in very complex sound situations. More than that though, like their higher level brother the LiNX 3D 9, we would expect them to deliver a completely new experience in hearing care to you if you want it. ReSound LiNX 3D hearing aids come with the superior sound quality of Surround Sound by ReSound. They work together, continuously exchanging data about your sound environment for optimized performance. 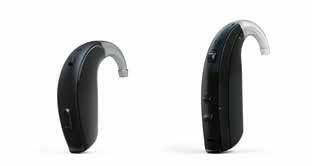 The Resound LiNX 3D 5 hearing aids are the latest entry level Made For iPhone hearing aid technology from GN Resound. While they are an entry level device, Resound have packed them with excellent features designed to give you the best experience. They should still deliver some really good results even in very complex sound situations. More than that though, like their higher level brother the LiNX 3D 9, we would expect them to deliver a completely new experience in hearing care to you if you want it. While this offered as an entry level hearing aid in this range, it is only that in comparison with other technology levels in the range. Resound have just launched their latest hearing device for people with severe to profound hearing loss. They are updated Enzo Made For iPhone (MFI) hearing aids with their new 3D platform which brings all of the benefits of that new system to this market. Those benefits include better spatial awareness and much better speech understanding in noise. With Made for iPhone® technology, you can stream phone calls, music and more from your iPhone, iPad® or iPod touch® directly to your hearing aids. If you have an Android or any Bluetooth-enabled phone, you can still stream calls, music and more with a discreet ReSound Phone Clip+ wireless accessory. Resound Assist is the really big news for both Providers and Users. Resound Assist will allow your provider to adjust your hearing aids remotely. That means if you want adjustments on the go, they can be provided without you having to attend the clinic. The system is really easy to use and is quite intuitive. This might not be for everyone, but this feature will be a god send for the people who love it. It will allow them complete freedom over their experience, over their customer experience. Looking For a Hearing Aid in Dublin?